I first came across Allan’s fiction in Interzone, and while her stories always struck me as well-written, there was a vagueness to some of the details in them which never quite rung true for me. ‘Flying in the Face of God’, which was shortlisted for the BSFA Award in 2010, is a case in point. The relationship between the two central characters is handled beautifully, but the story is also about a space programme for which one of them has been selected. And something about that space programme felt unconvincing. A recent reread of the story in the collection Microcosms did not change my mind. Of course, many people will say I’m missing the point of the story – or rather, by focusing on that one aspect, I’m missing what the story is about. And that’s almost certainly true. But a story is more than the sum of its parts, and a failure in one of those parts can throw the whole out of balance. It’s entirely subjective, of course – I can admire a story like ‘Flying in the Face of God’, without thinking it as good as everyone else seems to. And one thing I do admire about the story is Allan’s facility at creating worlds slightly off-kilter from ours, ones just strange enough to unsettle without seeming completely unfamiliar. Which brings us to The Race, her first piece of novel-length fiction. 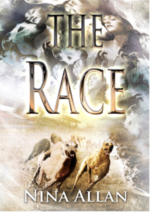 The Race comprises four novellas, titled ‘Jenna’, ‘Christy’, ‘Alex’ and ‘Maree’ after their narrators. Jenna lives in Sapphire, a town on the edge of Romney Marsh, in a future that is plainly not our own. Her brother, Del, manages a dog track, where smartdogs are raced by “runners”, people with an empathic connection to the smartdogs mediated by implants. ‘Jenna’ is essentially a family history and an exploration of Jenna’s small world (we learn very little of the world outside Sapphire). Jenna becomes a maker of handmade gauntlets for the runners, and Del gets married and has a baby girl. A few years later, the girl is kidnapped, and it transpires Del was involved with drug dealers and owes them money for a missing shipment. Christy, on the other hand, lives in our world. Her father and brother run a house clearance firm. ‘Christy’ focuses on Christy’s relationship with her brother, Derek, and his girlfriends. First Monica, and then Lin. Derek is a thug and a nasty piece of work. After he sexually assaults Christy, she leaves for London and university. She becomes a writer, and ‘Jenna’ is revealed as one of her stories. It is during one visit home that she meets Lin, who Derek tells her he will marry. But then Lin disappears, and Christy fears her brother may have murdered her. Alex is the ex-boyfriend of Lin, and a journalist based in London. He is contacted by Christy – several years have passed since the central events of ‘Christy’ – who asks him to come and visit her in her home in Hastings. She asks him about Lin, and he describes an incident when Derek assaulted him because Lin had come to talk over her fears about Derek. Alex also reveals that Lin is alive and well, as he saw her in the street several years later but she blanked him. The final novella is set in an alternate UK. Maree is an orphan and an empath, and she leaves her home in Scotland to cross the Atlantic to work on a secret project in Thalia (which seems to be a country in South America). This world also has smartdogs and shares some elements with that of ‘Jenna’ – in fact, it may be the same one but the narrow focus of ‘Jenna’ concealed the parts in ‘Maree’ that are invented. And the invention in the novella is… odd. Some places – London, Inverness – have the same names as real places; others do not – Lilyat (Lisbon? ), Bonita (Buenos Aires? ), Kontessa… And then there are the whales. Much of ‘Maree’ takes place aboard a ship crossing the Atlantic. This is considered a hazardous journey as convoys of whales sink ships when they come across them. And chief among the whales is the “baer-whale”, which is bigger than most ships. Maree discovers during the journey, from a fellow passenger who admits he is a private detective who had been hired to find her, that she is Del’s missing daughter from ‘Jenna’, and that she wasn’t kidnapped because of the drugs but because she is a natural empath. In other words, she doesn’t need an implant. This also means she is gifted at acquiring languages. The secret project she is joining is trying to translate alien messages from outer space. The things that are good about The Race are the things that Allan is good at. The mosaic structure plays to her strengths in that it allows for a tight focus over a relatively short wordcout. However, it also reveals a weakness: the links between the novellas are not quite strong enough to hold the novel together. Take the murder which appears in ‘Christy’ and ‘Alex’. Christy is afraid her brother killed Lin, but the truth is revealed in passing by Alex. Which makes the resolution of it, and the relief Christy must feel, completely secondhand, robbing it of any emotional impact. It’s not central to either novella, of course, but it feels like one of those details which never quite rings true. Which is not to say that every detail rings false. One of Allan’s strengths as a writer is the off-focus lens she shines on the worlds of her stories, and she does this by changing some details, such as the names of places, so that everything feels slightly off-kilter, and by keeping the relationships between the characters firmly at the centre of the narrative and the plot beats somewhere to the side. This is something that is more obvious in The Race than other works because each of the novellas exists at the edges of the preceding one. The writing throughout is, unsurprisingly, very good, and the characters are drawn extremely well – although if Jenna, Christy and Maree seem a little similar that’s an artefact of the structure, I suspect. As is the novel’s lack of, well, plot. The two science-fictional novellas wrap the real world ones, when you’d expect the reverse to be the case; but Christy’s life – since ‘Alex’ too is about that – doesn’t really provide a key to ‘Jenna’ and ‘Maree’. The mystery which exercises Christy for years does sort of map onto the disappearance of Jenna’s brother’s daughter. And Maree does end up with a completely new life, much as Alex reveals Lin to have. Even then, revealing what happened to Del’s daughter doesn’t really resolve anything, as ‘Maree’ only catapults her into a new, and unsolved, mystery. I’m also not really sure what role the dog racing plays, or why it provides the title, since it only appears in ‘Jenna’, which is Christy’s creation anyway. The end result is, I think, one of 2014’s more interesting genre novels, and certainly proves Allan is a writer to watch. I’m not convinced The Race is wholly successful, but it’s definitely a worthy attempt. If it doesn’t quite match another 2014 genre mosaic novel, Paul Park’s All Those Vanished Engines, that’s probably because Park goes full-on metafictional, and Allan sort of nibbles at the edges and never quite commits. Or perhaps it’s just that Allan’s form of metafiction is less overt – it lives within her stories rather than providing the stories’ building-blocks. Having said all that, I won’t be surprised if The Race appears on one or two shortlists next year. Categories: book review, first look 2014, nina allan, science fiction | Tags: book review, nina allan, science fiction, the race | Permalink. I think that Allan is a very clever writer who lays down really evocative prose and the effect is really quite intoxicating but there is a question as to how much is actually being achieved beyond the cleverness. Silver Wind definitely raised this question as the way the stories interacted with each other was really clever and really evocative but I’m not sure what ends the cleverness served. I generally associate that type of cleverness with the literary end of fantasy and I’m not sure how I feel about it appearing in SF. I liked the novel a lot but that’s mainly because I responded to the prose and the blurring of really interesting realities but I agree that there are questions that could probably be asked of Allan’s methods. I’m not sure if it’s a strength or a weakness, but there always seems to be something in an Allan story whose narrative purpose you can’t fathom. The baer-whale plays such an important part in ‘Maree’ and it seems to represent Christy’s feelings – her fear? – for her brother. But I’m not sure what the secret project to decrypt alien messages is intended to be. However, it also reveals a weakness: the links between the novellas are not quite strong enough to hold the novel together. Mosaic novels live and die on these links. Given her previous writing, I’m kind of not surprised that she didn’t quite manage that trick. More generally, it goes to wondering if writing short fiction is, in the end, a good “Training ground” for writing at longer length. That might be a little unfair, as I think the mosaic novel is an interesting structure – writing short fiction is ideal “training” for it. It could be argued the Apollo Quartet is a mosaic novel published in 4 parts. Having said that, there are novels where the prose feels better-suited to a short story – I don’t think that’s the case for The Race, if only because it is put together from four novellas. I think Paul is being a bit unfair. Mosaics can be connected in a number of ways. The most obvious is plot but you can also connect things via theme or motif (which is what Ian is doing with AQ) but Allan doesn’t do any of these things… Silver Wind used emotional resonance and I think the Race works on the same level (despite the attempt to use plot and setting as well). There are connections… you can feel them… but it’s not immediately obvious what they are. My thoughts about The Race were much the same as yours, Ian. Both “SF” novellas worked well on their own and as reflections on each other. The first of the two “our world” ones also worked well. I think the second of them threw the whole project off beam by casting too many doubts on the first – and on itself.